Kyle Oehmke defends physicians, hospitals, and other medical providers in malpractice litigation at the trial and appellate levels. 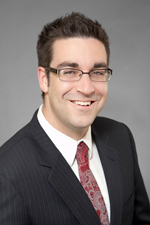 He also maintains an active practice in the areas of tort and commercial litigation defense. Prior to joining Hinshaw & Culbertson LLP, Mr. Oehmke worked for two years as an attorney at Brown & James, P.C., a large St. Louis-based civil defense law firm. His practice areas there included insurance law, premises liability, employment law, and complex business litigation. Before that, he served as a law clerk to the Honorable J. Phil Gilbert (U.S. District Court, Southern District of Illinois). Mr. Oehmke has also held a summer associate position with the law firm of Heyl, Royster, Voelker & Allen, a graduate assistantship with SIU’s Paralegal Studies Department, and internships with the Madison County (Illinois) State’s Attorney’s Office and a small bankruptcy firm in his hometown of Centralia, Illinois. During law school, Mr. Oehmke was elected editor-in-chief of the Southern Illinois University Law Journal. He was also a member of the school’s trial team, which participated in nationwide competitions. Defense verdict following a bench trial in St. Louis County, Missouri. The lawsuit stemmed from a commercial lease between plaintiffs and Mr. Oehmke's client, a recycling company. Plaintiffs brought three causes of action and sought damages in excess of $50,000.00, alleging that Mr. Oehmke's client improperly withheld rent payments, damaged the real property, converted certain personal property, and failed to pay for undisputed use of a forklift on the property. Following a thorough cross-examination of the plaintiff landlord, the Court specifically found him not to be creditable. Ultimately, the Court returned a defense verdict for Mr. Oehmke's client on all counts and even assessed costs against plaintiffs. Summary judgment in favor of two nurses in a suit pending before the United States District Court for the Southern District Court of Illinois. Plaintiff, a former inmate of Tamms Correctional Center, filed suit against the nurses for deliberate indifference to his medical needs in violation of the Eighth Amendment. Specifically, plaintiff alleged inadequate medical treatment following an altercation with prison staff, improper refusal to transfer him to a hospital outside the prison, and failure to provide follow-up treatment. Mr. Oehmke argued that plaintiff failed to file a proper grievance against the nurses and thereby failed to exhaust his administrative remedies. The Court agreed and entered summary judgment accordingly. Wilborn v. Ealey, et al., 2015 WL 1258428, Case No. 13-cv-70 (S.D. Ill. Mar. 17, 2015). Successful representation of one of the nation's largest not-for-profit providers of community-based behavioral healthcare in a qui tam lawsuit under the federal False Claims Act and Illinois False Claims Act. On the morning of the relator's deposition, he agreed to dismiss all claims against Mr. Oehmke's client with prejudice. "Survey of Illinois Law: Medical Malpractice," 35 S. Ill. U. L.J. 645 (2011). "Game Over? A Call for Reform in Illinois Insurance Law's Treatment of Test Drivers," 33 S. Ill. U. L.J. 547 (2009) (awarded SIU Best Legal Comment in 2008). "Holding on to Creditors' Rights under the ‘Hanging Paragraph' of BAPCPA: Analysis of In re Wright," 492 F.3d 829 (7th Cir. 2007), 33 S. Ill. U. L.J. 95 (2008). Mr. Oehmke enjoys concerts, movies, and traveling with friends and family.